Ever since I upgraded my iPhone 5 to iOS 9, I’ve been frustrated by my daily phone experience. The situation had been deteriorating for a while, with daily Google Account access becoming so frustrating, I actually installed Outlook on iOS in an attempt to make email work on my phone. For me, my phone is where I do the majority of my work and it had literally become painful to make it all play nice under iOS. My old iPhone 5 also took a performance hit with iOS 9 and the tiny 4″ screen was causing feelings of inadequacy at meetings where everyone was touting their 5.7″ monster phones. I’d seriously considered making the switch to Android when the Nexus 5 came out. With people like Mike Vollmert and Jim Klein egging me on, it seemed like a sensible thing to do. But family iMessage, battery life and the camera all held me back. All of that and the comfort of knowing iOS worked well for our family (with iPads and AppleTVs being abundant in the house). So for the past two years I made it work for me. But this time around I decided it was time to look at Android again. The three main sticking points last time are mostly gone with the camera being on par with the iPhone, the battery being better in Android (although I don’t think as good as in iOS) and iMessage no longer being an issue now that we have an SMS plan (yes, welcome us into the 21st century, thank you). On black friday, I took advantage of the $80 off deals at the Google store and bought a Nexus 5X 32GB. Of course it arrived while I was down at the CETPA2015 conference. As soon as I got back, I unboxed it, set it up and have been using it since. Yesterday, I took it to #edcampsalinas and put it through the paces. Using it for a solid 4 hours of active use, I made it home around 3pm with 5% battery left. Running Google Maps to and from and installing and updating apps while following the edcamp action on twitter all morning was a torture test and the Nexus 5X held up well. I’m a huge fan of the Finger Print sensor on the back and the notifications in Android have already simplified my work flow. What’s really apparent is the seamless integration of both my personal and work Google accounts into the OS. They both just work. I’m still working through possible twitter apps, being a long time Echofon user on the iPhone but the native app works well and Jim recommended Talon which I’m also trying out. The big win is Google Now. The Cards are really cool and I look forward to getting to know all the things it can do for me (or is that Google getting to know me more?). Google Keep is also something I need to explore, having lost the integrated Notes app in iOS and MacBook. 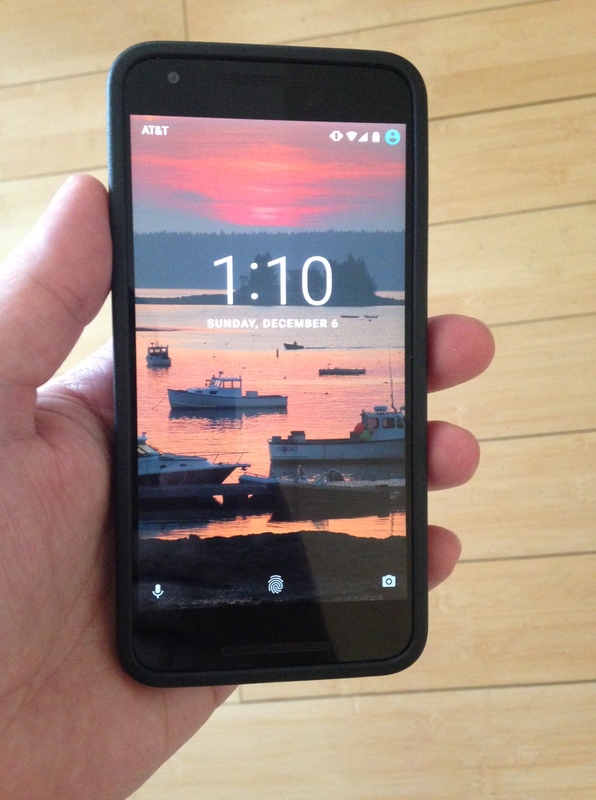 Based on my 24 hours with the Nexus 5X, I have now ordered myself a Nexus 6P and as soon as it arrives, the 5X will be replacing my wife’s iPhone 5 . I really like the size and form factor of the Nexus 5X but I realize since the phone is my primary computing device, I’m going to need the extra battery and the extra CPU horsepower of the 6P. Apps. I have yet to miss an App on Android that I was using daily in iOS. In fact, after years on iOS and downloading every new free app on the market, my App life had become seriously cluttered. Now, I’m still early days on Android, but for my daily web browsing, social media, news and communication needs, Android has me covered. I had just discovered the joy of AirDrop to move files between my MacBook and mine and my wife’s iPhones. “Forever” Standby Battery Life. I don’t know if Android users realize this but with my iPhone, I could leave it uncharged overnight and barely lose a few percent in battery life through to the morning. I once left an iPad for a week and came back to find it still had over 1/3 of a charge left. With Android, I’m not seeing that kind of standby conservation. Maybe Doze is just too new to have that kind of effect yet. It just means I have to remember to charge every night. Luckily the Nexus 5X charges wicked fast. Quick camera focus. The Nexus camera app feels a little sluggish on the 5X and what is most noticeable is how long it takes to focus before it will snap the picture. I think there is a setting I am missing that will force it to snap a pic even if it isn’t in focus, but by default, the delay between pressing the button and taking the picture is a bit jarring right out of the box. The iPhone seemed to snap the picture pretty much instantaneously (which might explain all mu blurry pics). To get over the loss of AirDrop, I have been pretty happy with SHAREit.